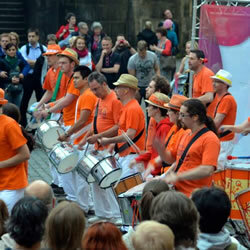 Loud and lively, energetic and dynamic - The Edinburgh Samba School (TESS) is a regular and popular feature of community festivals and special events in Edinburgh and elsewhere in Britain and Europe. From our humble beginnings in 1992 we have grown to become a loud and lively performance group specialising in authentic rhythms from the flamboyant Carnival culture of Brazil. Samba is the heartbeat of celebration, street parties, dance, and fun - our aim is to promote Brazilian carnival culture throughout the UK and Europe. All funds raised by TESS are used to sustain the group’s activities in the community - teaching, rehearsing, purchase and maintenance of instruments - as well as a variety of outreach projects. TESS has performed at many high profile events in Edinburgh including the Murrayfield Rugby 7s, the Edinburgh Festival Cavalcade, the Jazz and Blues Festival Mardi Gras, Edinburgh’s Hogmanay and many more. 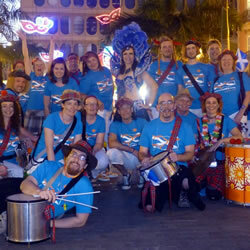 We’ve also performed further afield, including in the Tenerife Carnival (the largest outside Rio! ), Amsterdam’s King’s Day, and the Fête de la Musique in Paris. We also drum and dance for street festivals, private parties, community or corporate events, club gigs - anything that requires a loud party atmosphere. TESS runs regular percussion and dance courses for anyone who is interested in performing with us or fancies giving it a try - it’s great fun! There are plenty of other ways to get involved too. If you’d like to see more of us in action, take a look at our Facebook gallery and Youtube channel. 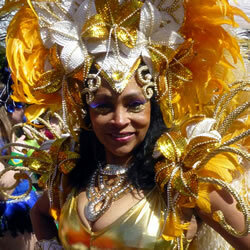 We perform regularly in festivals, carnival parades, nightclubs, and at corporate, community and sporting events. The kind of performance can vary greatly, from a short set on a stage or dance floor to a full-blown carnival parade with dancers. We can tailor our performance to suit any event, large or small - contact us to discuss your event requirements. Check out some videos of our performances below, or on our Youtube channel. We have considerable experience in running workshops in samba drumming, covering a wide range of requirements from team-building for corporate clients to community events with school-children and people with special needs. We will carefully tailor workshops to your needs, and instruments can be supplied on request. 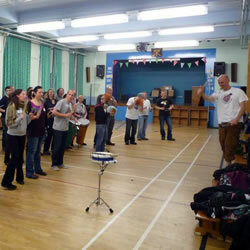 TESS runs street drumming courses throughout the year, with classes beginning in early new year, Spring and Autumn. We aim to introduce different rhythms and songs, as well as technique and getting a feel for what it is like to play in a Samba band. The courses cost around £50 which includes a copy of our CD, and generally run for between 8 and 10 weeks. If you prefer, you can try the first week for £10 before deciding whether to commit to the full course. We provide all the drums and equipment. There may also be a chance for a busk or performance at the end of the course - show off your new skills to your family and friends. View details of our next street drumming course or sign up to our mailing list. If you enjoy our street drumming course and are interested in joining the main band and performing with us then talk to the teachers on your course. Joining the main band comes with a steep learning curve, so natural ability and a commitment to drumming is vital. Entry to the main band also depends on the requirements of different sections, which change over time. We have our very own CD, Segure O Baque, recorded with our Brazilian friend Allysson Velez. The CD is available for purchase for only £7.50 inc postage and packing. Please allow 21 days for delivery. TESS runs Brazilian dance classes throughout the year on a Thursday evening from 7.30pm to 8.30pm at Tollcross Community Centre (Tollcross Primary School). Individual classes cost £5 but you can also buy a 10-class pass for £45, giving you one class free, which is ideal if you plan to attend the classes regularly. Concessions are available for students, so please bring your student card to class. 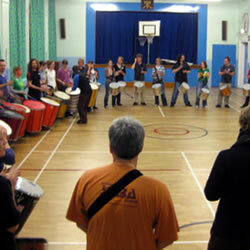 Approximately once a month we invite a ‘miniband’ of TESS drummers to play live music in class. This is always a blast, with amazing beats and high energy music and dance. It also gives you an opportunity to become familiar with the band pieces, should you ever join us in performing with the band. For more details, visit the TESS dancers Facebook page. Dancers who attend the classes regularly and feel confident with the basic steps may be asked to join us in performing. We dance alongside the drummers as part of a gala day parade/festival, or in static performances, such as club gigs. Most performances involve some freestyle dancing as we follow the drumming band and there are also occasions when we dance choreographed routines or steps, either with the band or with recorded music. We encourage dancers to create or purchase their own show-stopping samba costumes and headdresses for Samba performances. We have headdresses, skirts and tops which dancers can use for standard gigs and folkloric dances, such as maracatu and Ciranda. We also arrange occasional headdress and costume making workshops for those who want to make their own or contribute to the TESS collection. General news about the band. Our gig and course calendar. 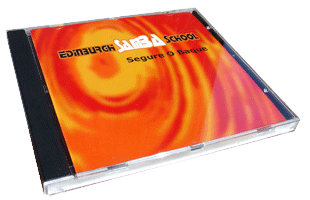 You can send us a message by email at contact@edinburghsambaschool.org, or through our Facebook page. If you'd like to be kept up-to-date with information on our street drumming courses, please enter your email address below. You can unsubscribe at any time. TESS aims to comply with data protection laws with regard to your privacy and any information you enter into this website. We use analytics software to gather data about visitors to our website. This may include the use of "cookies". The information gathered is anonymous and aggregated and is not used to identify individuals. We store any information you submit to this website (name, email address, phone number) for the purposes of informing you about our work and activities. We do not send unsolicited communications or share your information with any third parties except where legally required to do so. We provide mechanisms to unsubscribe from our mailing list, should you no longer wish to hear from us. If you have any questions, please feel free to contact us using the details in the Contact Us section.